I find gardening to be the ideal activity to pass the hours away, completely lost in the solitude and pleasure of time alone—just me and my plants. Honestly, I revere those rare occasions of peaceful bliss. It is a wonderful break from the busy pace we all seem too caught up in these days. However, there’s another side of me that relishes the opportunity to experience the joys of gardening with others even more. There is a certain excitement and energy in sharing such a wonderful activity. 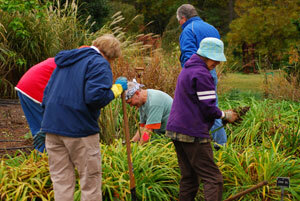 Community gardening is the perfect way to scratch that gardening itch. And I love it for even more than simply the social interaction of a shared passion. Gardens do bring out the best in people and community gardens are a great place to bring it all together. First, we learn so much from others. Even as an experienced gardener, I always enjoy the contribution of others and admittedly, I learn something new all the time. On the other hand, what a joy it is to be able to share some nugget of wisdom with a budding fellow gardener. I still get a kick out of feeling the excitement of those I am able to help improve their skills. And it’s a wonderful opportunity to start an ongoing dialogue with a new friend. Best of all, community gardening provides an opportunity to give back; from beautifying a run down or neglected space, to unifying a neighborhood or community to donating the harvest to a local food bank or shelter as with the Plant a Row for the Hungry project. There’s a magnetic quality that seems to draw people into a garden. Strangers become friends and neighborhoods come together in a community garden. It often becomes the catalyst to stimulate social interaction and community development. Quality of life improves and neighborhoods are beautified. And what better way to enhance an unadorned space while creating a place to connect people across inter-generational and multi-cultural boundaries. But community gardens take more than the dedication and determination of its caretakers. When it comes to providing the equipment and funding for the start up and ongoing costs involved in smaller projects, individuals may chip into the pot. It’s also possible that grants for these plans might be available from the city, state, or federal government to subsidize such a project. Even some corporations with an interest in gardening often set aside grant money to promote community gardening efforts. Fiskars is one such corporate example. Their grant program, code named “Project Orange Thumb” was started in 2003. The company helps provide community garden groups with the tools and materials they need to reach their goals, from neighborhood beautification to horticultural education. Through 2007, the project has provided over $200,000 to more than 100 community groups, providing everything from gardening tools to the seeds and plants to get started. Grants like these from generous corporate and private donors make it possible for groups of all ages and interests, without regard to financial means, to become involved in their schools and communities through beautification and outreach, make friends and get their hands in the dirt, all in the name of gardening!